Ever make a snap decision in the spur of the moment, without thinking, that results in severe negative consequences and massive regret? Let me qualify that these consequences automatically require a complete change in course to deal with the mess you’ve created. To ignore the situation would be completely illogical regardless of how inconvenient, costly, or embarrassing. On May 22, 2017 I was scheduled to give a presentation at one of my client’s offices. It was a normal morning in that I was running on time and the meeting was only a few minutes from my home. I would literally take side streets the whole way not having to venture on any major roads. 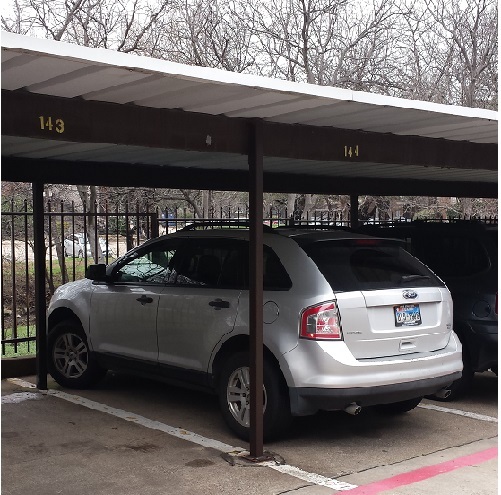 My Ford Edge was just across from my apartment under the covered parking area which is my standard as opposed to using the open parking area. For every two parking spaces, there is a support column that runs from under the roof down into the ground packed in by concrete. One way or the other, you will have one of these support columns on your back left or right as you pull out. Parked next to “my pole” exactly as the day my little event occurred. I had lived at this property for a couple of years and had pulled in and out of the various parking spaces a zillion times. There is no assigned parking and yet I always park in the same general area. On this particular morning, the support column was on my back left. Please understand that our parking spaces are rather skinny so your margin for error in hitting another car or one of the support columns is rather thin. As I walked out to my car, I casually noticed that there were no cars to my immediate left or right but for some silly reason I completely zoned out on the location of the support column. After a few minutes of allowing the engine to warm up, I put it in reverse and rather aggressively backed out cutting hard to the right. The noise that followed was sickening as almost I ripped off my driver’s side mirror as the support column tore into my front left fender just behind the wheel…much like a can opener. At the Progressive Service Center turning my Edge in to be repaired. To say that I was shocked would be an understatement. And that was while I was still sitting in my vehicle. I never imaged the damage would be as bad as it was until I stepped out to inspect my handiwork. What an idiot! In a split second of stupidity, I had crushed my vehicle and nearly snapped the support column in two. Fortunately it didn’t give in and the roof was saved from coming down on me or any of the other cars. My first thought was can I still go to my presentation and then deal with the situation afterwards. Not knowing for sure if my vehicle would even drive normally, I carefully backed out and moved forward ever so slowly. Fortunately I didn’t hear any bad noises so I opted to head over to my meeting. I probably never went over 40 miles per hour by the speed limit and yet this was fast enough to hear some scraping noises as my tire was getting into the bent vendor. I backed off my speed and really tried to take it easy and not do any damage to my tire. To say that my mind was somewhere else during the presentation would be another understatement. All went well under the circumstances and yet I was eager to wrap up the meeting and dig into getting my car repaired. Amazing the damage that occurred in a split second. My first call was to my good friends at Carrollton Good Year. James the assistant manager answered the phone and I explained my situation. They’ve been taking care of me for over ten years so when he laughed at me for my ignorance, I didn’t take it poorly. It was kind of funny. Stupid, but funny. 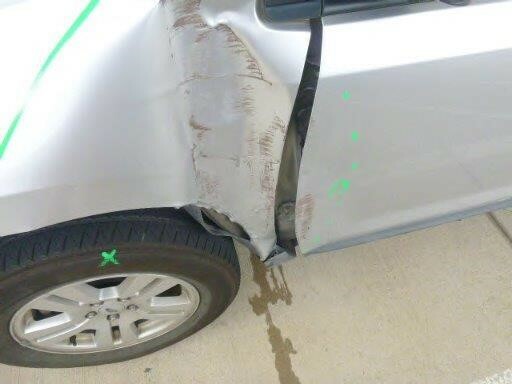 To show the extent of the damage, I sent him a couple of photos. He was quick to explain that what I needed was a body shop not the services that they offer and referred me to several local businesses for help. 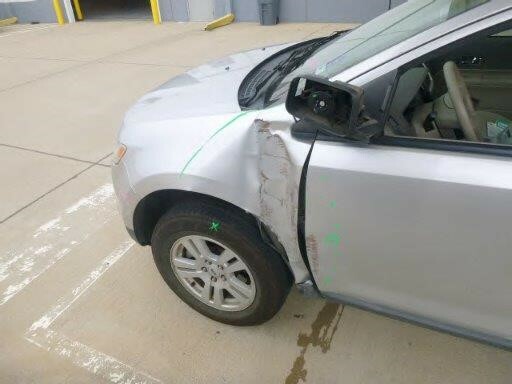 Before contacting any of the body shops, I thought it prudent to call Steve Thumann with Thumann Insurance. He laughed at me too. It’s okay…he’s been taking care of me for over 20 years. Steve explained my options which were really simple and off I went to deliver my vehicle to a Progressive Service Center where they would take care of the body work and set me up with a rental. It was a smooth process and fortunately I was only out the cost of my $500 deductible. If there was any silver lining to my experience, I was fortunate to drive a really nice Camry for the two weeks it took to have my Edge repaired. On Memorial Day, Monday the 29th, I headed up to Oklahoma City for work and was scheduled to be gone through Friday when my vehicle was due to be ready. It’s odd to me how the ramifications of our stupid decisions continue to ripple…on and on and on. The week in Oklahoma went great however Friday was a long day and I was late getting back into the DFW area. The Progressive office with my car is located in The Colony and I live in the North Dallas area where Addison, Carrollton, and Plano all come together. As I hit the Dallas city limits coming in from the East on I-20, I had to go all the way to the North Dallas tollway (in rush hour traffic) and then make my way up to The Colony. To add insult to injury, there was the storm of all storms blowing in from the West. The sky was black, the wind blowing, the rain coming down sideways, and the thunder and lighting made it all the more intimidating. Fortunately I hit the Progressive office before the worst hit and was able to pick up my vehicle and get back on the road for home. What should have taken 30 minutes or so took well over an hour due to the Friday afternoon traffic compounded by the horrific weather. As fate would have it, I ended up parking next to “my pole” back at my apartment complex. It had been repaired and repainted during my trip and since my insurance paid for it, I feel it’s only fair to call it”my pole”. Now there’s not a day that goes by regardless of where I park at my complex that I don’t think of my little incident. Needless to say I am exceedingly careful with how I back out always fully aware of where the silly support columns are located. My first boss as a teenager working at our local country club used to always harp on us to be aware of what was going on around us. Working on a golf course comes with its potential hazards with one being in the form of the golfers and their little white balls which can be like little missiles from longer ranges. While I’ve never been hit, I’ve had some close calls. I’ve never forgotten Dave’s prophetic words and yet I still have my moments where the guard comes down. All I can say is be careful and pay attention to what’s going on around you. And further, think before you act. While the following touches directly on the spoken word, I think it would be safe to say that being “hasty in actions” is equally foolish. This entry was posted in learning from mistakes, seeking wisdom, trials & tribulations, Uncategorized, wise choices and tagged learning from mistakes, seeking wisdom, trials & tribulations, wise choices. Bookmark the permalink.